Your post leaders are often totally amazed at the original thinking that individual members come up with to support our post. Your post commander could not succeed without their ideas and support. He knows what gets done behind the scenes, but do you? Here is one that bears mentioning. The question was, “How to increase post visibility as a rental site?” Robert Medred worked with fellow members of his Chapel Hill Leads Group. This is an active group of local small business owners who meet weekly at the post to share ideas. One idea was to get advertising (at no cost, of course). He worked with Donald Bonin, also a post member and member of Chapel Hill Leads. Don owns Town and Country Trader, a local advertising magazine for local businesses. We now receive a monthly no-cost ad that promotes our rental facilities. Several months ago, Robert came up with another idea. “Lets make our Legion Road sign a little more prominent and announce more events,” he suggested. 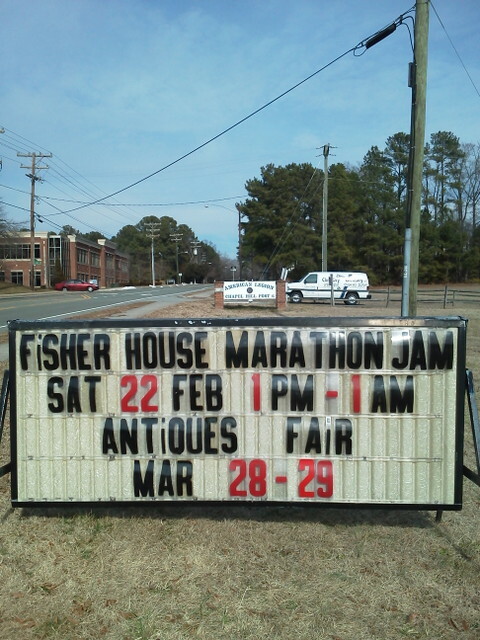 The sign was cleaned up, moved, and is now proudly announcing post events. You’ll often find Robert changing the letters. But, wait! There is more (and much more than can be listed here). Robert has a local business restoring carpets without chemicals. He frequently places an insert in the “Money Mailer” for his business, Chem-Dry of Chapel Hill. Chem-Dry has teams in Burlington, Hillsborough and Durham to serve housing complexes throughout the area that insist on Chem-Dry for their business carpets. There are many business owners like Robert Medred that are members of our post. They know how to succeed, develop, and grow a business. They share their time and skills at the post. It is their ideas, financial support, and drive that have served our Chapel Hill Post 6 for almost 100 years. We could not exist without member support. So, it all does start at home. Friends helping friends. Neighbors helping neighbors, Veterans supporting other veterans and, especially, supporting our post members. Remember that the next time you need a product or service. Are you starting your search at home among your Legion Family? You may find that a comrade in the post can help you find or provide the help you need.